The NY Times is predicting it’s harder to “get on someone’s gift list than it is to get past a velvet rope,” but Weleda has a solution that’s under $10 for the granola gal in your circle. 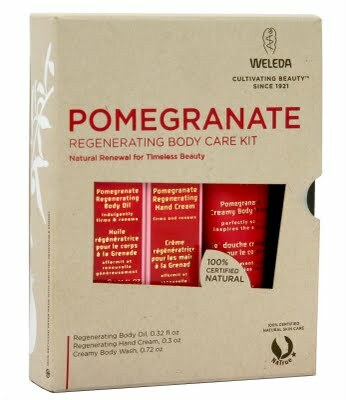 The Weleda Pomegranate Travel Kit ($9.99) includes travel sizes of their Pomegranate Body Oil, Hand Cream and Creamy Body Wash made from 100% organic pomegranate seed oil from Turkey. Bonus! Weleda is offering a holiday special which includes free shipping on all online orders until December 24.